Having survived a night of gleeful terror at Universal Orlando’s annual Halloween Horror Nights, I can report that #HHN is a blast. Its — a frightful fest of doom that’s worth repeating annually. Both Universal Orlando and Universal Hollywood reach out to a fresh crop of master storytellers, as well as sharing original tales, so there are always new horrors to survive. This Year’s Horror Makes #HHN Worth Returning To! Dead Exposure: Patient Zero is the first original content haunted house coming to Halloween Horror Nights 2018 at Universal Studios. Very realistic haunted houses are based on the top horror players, be they video games, movies or TV series. For 2018, a lot of terror is centered on “Halloween 4 The Return of Michael Myers,” plus haunts based on “Stranger Things.” Just as “Poltergeist” is getting featured in Orlando, “The First Purge” will shock audiences in Los Angeles. Both parks are doing interesting behind-the-scenes R.I.P. Tours for a hefty premium, but if you ever wanted to know how to do expert Halloween makeup, that’s the package you need to experience. Many of this year’s new mazes are based on the fourth installment in the classic “Halloween” slasher series created by John Carpenter. Picture yourself in Haddonfield, Illinois on Halloween night. Then… get lost. There’s much more than meets the eye when you arrive at the spinning Universal globe, and I don’t mean because it’s shrouded in a sickly mist. Those who return to Universal Studios after 6pm almost any night from mid September to early November (Sept 14-Nov 3, 2018) will encounter a terrifying Halloween transformation unlike any other. Unbeknownst to us, among the thousands of park-goers out for a fright were hundreds of zombies, living dead, World War Z extras — call them what you will, these energetic people are expertly made up, costumed and choreographed to come up from behind and breathe down your neck. Halloween Horror Nights is well crafted and touchey-feeley, even when the theme is not “The Walking Dead.” On the streets and in haunted houses, we survived several machine gun attacks between aliens and law enforcement, a retired Army tank shooting at a rooftop sniper and these dead things with bad breath. “Resident Evil” was the first haunted house (huge – it occupied an entire sound stage) we toured, and the entrails and organs being consumed by amphibious-looking aliens made us wish we had not eaten so much dinner. As we got bolder, moving more slowly to study the artistry in set design, costumes and prosthetic makeup, we entered the forbidden lab. OMG! 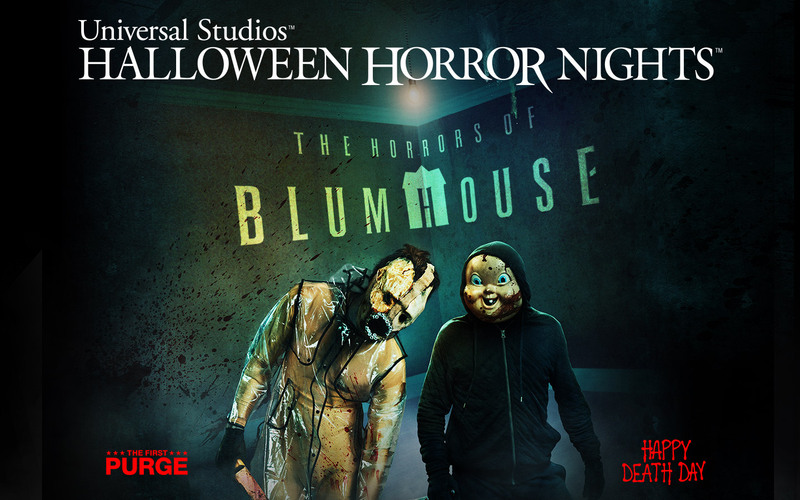 The Horrors of Blumhouse is one of many terrifying experiences at Universal Studios’ Halloween Horror Nights. We used an Express Pass that enabled us to go to the head of the line at each haunted house, meaning we had no guilt about leaving them quickly either. Lines averaged 20-30 minutes’ wait at our visit, but with several vendors selling Blood Shots, beer, and steaming cocktail confections, the wait was as important a social event as the environment itself. It’s an adult affair; Universal Orlando Resort recommends HHN to those over 13. Still, if you have kids of any age in tow, that Express Pass comes in handy, especially after a long day on thrill rides. There’s only so much excitement a body can take, right? This year, there’s a bigger variety of ticket packages available online, including the Frequent Fear Plus Pass, giving you up to 28 nights, including all Sunday through Friday event nights, plus the first and last Saturday nights. Really? Universal Orlando Resort also has hotel packages that combine an HHN ticket to the parks. 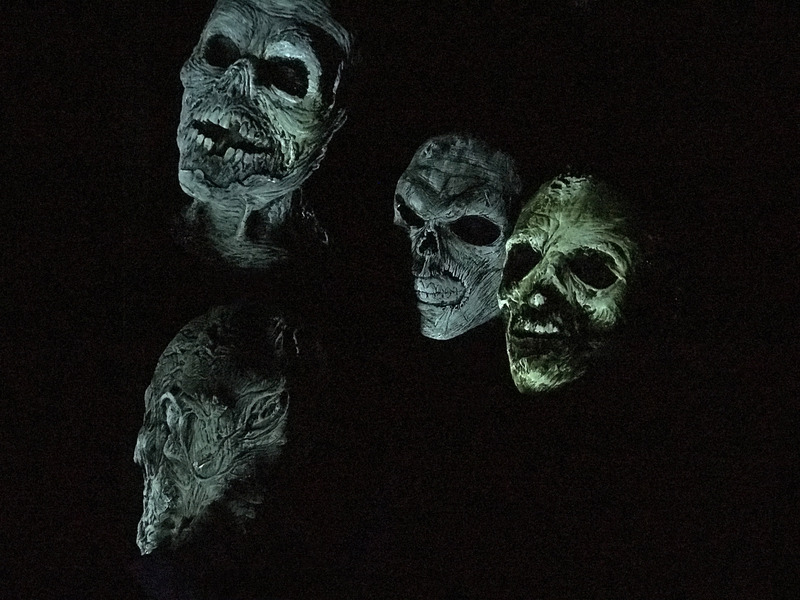 In addition to the street performances, haunted houses, and vendors, several popular rides and coasters remain open after dark and some are decorated too. We certainly got our money’s worth of scare and had a lot of laughs after we got safely back to our hotel. Keep in mind that no costumes or masks are allowed so, other than drinking to steady the nerves, the crowd is pretty tame. For more information, visit Universal Orlando’s Halloween Horror Nights or Halloween Horror Nights Hollywood. Buy ahead or be dead; these events do sell out quickly. This sounds like so much fun! From the haunted houses to the different drinks offered. I didn’t know HHN was such a major part for Universal Orlando. Good to know! Thanks for the article!